What you need to know about drift diving. Ways to try keep safe, and minimise risk while drift diving, especially when diving in strong currents. Staff here at DAN Asia Pacific was recently contacted by the sister of a diver that went missing during a dive in Komodo on July 14. Komodo is well known as an area prone to strong currents, and this is one factor being considered as a cause for this incident. We’re still trying to determine the facts so that we may learn from this tragedy, but the incident prompted us to look at ways to try keep safe, and minimise risk while drift diving, especially when diving in strong currents. Diving in current brings different emotions to different people. Some divers are terrified by the idea and will do anything to avoid a current and others seek out drift diving for the thrill of the ride. Whichever kind of diver you are, diving in current is a specialty that requires careful planning and procedures. So, if you know in advance you’ll be diving in an area where you may experience strong currents, you are sufficiently prepared and know how to respond. What is the procedure for locating a missing diver? Do you use a dive float to mark the diver’s position at all times and are surface markers (SMBs) provided to the divers? It is a common in some areas to conduct drift dives without a surface float, with the boat following the diver’s bubbles. This is not a good practice for several reasons, including that in the event of waves, strong winds or rain the bubbles may be obscured from view; and in strong currents the bubbles may surface quite a distance from the diver’s position. You should dive with a surface float when diving in current-prone areas. Having a lookout watching the float and watching for any divers who may surface away from the float prior to the end of the planned dive is also advisable. 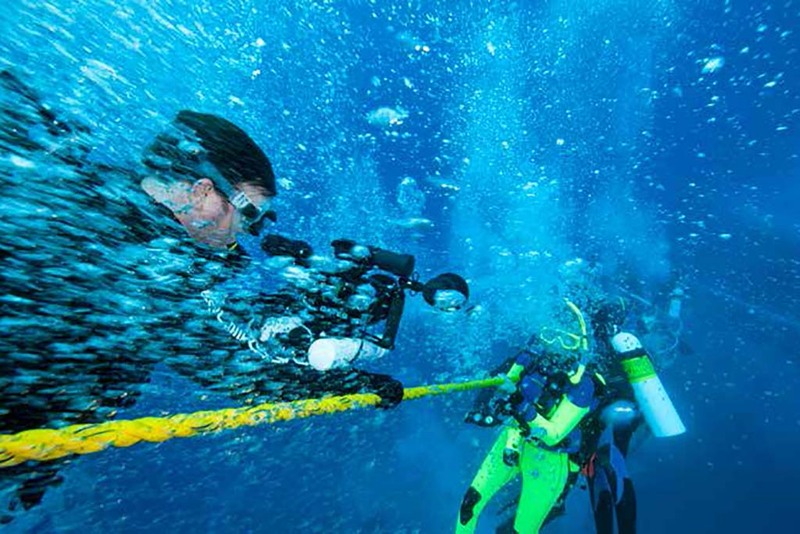 Pre-dive equipment checks are necessary on any dive, but particularly drift dives – dealing with a broken fin or mask strap in strong currents can be challenging. Before entering the water, ensure your kit is streamlined, with hoses tucked away, and make sure your air is on. Your drift-dive plan should include the process for keeping your group together as well as a plan for picking up divers that get separated and surfacing earlier than expected. Importantly, all participating divers must be aware of – and agree to – the plan. Before entering the water, the current should be assessed for strength and direction and everyone advised. Don’t be afraid to ask the operator about their safety plan for current diving before you sign up for your dives, and if you aren’t happy with their responses choose another operator. If you don’t feel comfortable with the dive plan or the dive, ABORT. During the dive, it’s critically important to pay attention, current diving can be fast-paced and the slightest distraction could have you separating from your buddies or crashing into the reef. Dive operators should ensure there is a dedicated lookout on the boat to watch the float and look out for any divers surfacing away from it. The boat should follow the dive and not disappear from the area for any reason. Use the float line for your descent and ensure everyone is at the bottom before moving off – and always stay within sight of your group. If you lose the group or need to surface for any reason, try to do so close to the float. Deploy your own personal SMB and wait for the boat to come to you. It may also be necessary to use a whistle, air horn or mirror to attract attention if you have surfaced away from the float. An emergency beacon or marine radio (such as the Nautilus Lifeline unit) may also be useful if you are not quickly spotted by the lookout on the boat. Listen carefully to the pre-dive briefing and instructions from the crew. Ensure the operator has an emergency management plan for locating and recovering missing divers or divers that surface away from the float/group. Keep close to the dive guide. Do not try to go against the current by grabbing the bottom. Advise the dive guide when it’s necessary for you to surface. Surface as near to the float as possible. Stay clear of the boat’s propellers. Avoid the down-current side of the boat and hold onto any lines thrown out by the crew while waiting for your turn to exit. Remain calm if you are swept away from the boat. Deploy surface signalling devices as needed (SMB, whistle, air horns, mirror, nautilus lifeline etc.). Ensure that the surface support includes a dedicated lookout to watch for divers surfacing and that they will not leave the area for any reason during the dive. Next Next post: Lord Howe Island – an adventure playground for divers!